In this article we will talk about the WinSxS folder in Windows 10 and Windows 8.1, the reasons of its constant growth and ways to clean up it. The C:\Windows\WinSxS directory is the repository of Windows components. This directory contains DLLs, binary and XML files necessary for installation and operation of any Windows roles or features. When installing the Windows updates (usually this happens every month), the new version of the updated component is installed in the system, while the old one is saved to the WinSxS folder (it is necessary to provide compatibility and make it possible to roll back to the old versions of the components when you uninstall the problematic update). How to Enable NTFS Compress on WinSxS Folder in Windows 10 and 8.1? Over time, the WinSxS directory is constantly increasing, and its size is not limited by anything (although in practice the size of the WinSxS folder in Windows 10 / 8.1 rarely exceeds 15-20 GB). The easiest way to reduce the size of the WinSxS folder in Windows 10 and Windows 8 is to remove the old versions of the components remaining after the system update. 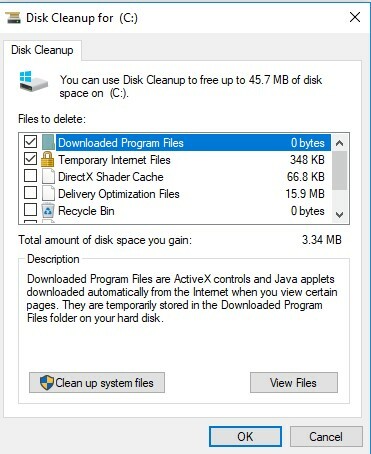 To do this, you can use the standard disk cleanup wizard (cleanmgr.exe) or special options of the DISM command (see below). Tip. In Windows 7 SP 1, you can delete old update files using the disk-cleaning utility only after installing a separate update – KB 2852386. As you can see, in this case, I can reduce the size of the WinSxS directory by (1,86 + 0,42) Gb. Many users often ask: if it’s possible to manually delete files from the WinSxS folder? The answer is categorically NO! These actions are likely to result in injuring the Windows image health. Though some attempts to remove files from the WinSxS folder can be successful, this method cannot be recommended due to its potential danger to the system. WinSxS folder compressing – a way to reduce the size of the WinSxS directory using the NTFS compression. To reach the best result, you can use all three ways together. Then select the “Windows update cleanup” option. 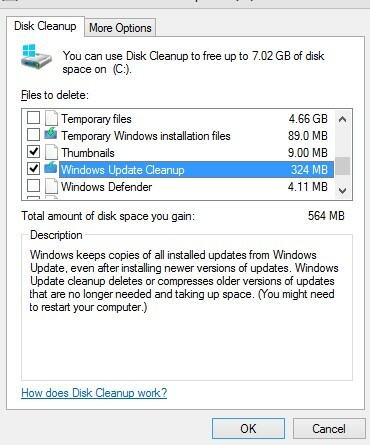 The Disk Cleanup utility will show how much space you can free up by deleting old Windows update files. In my example, this is 324 MB. Click OK to start the clean up. 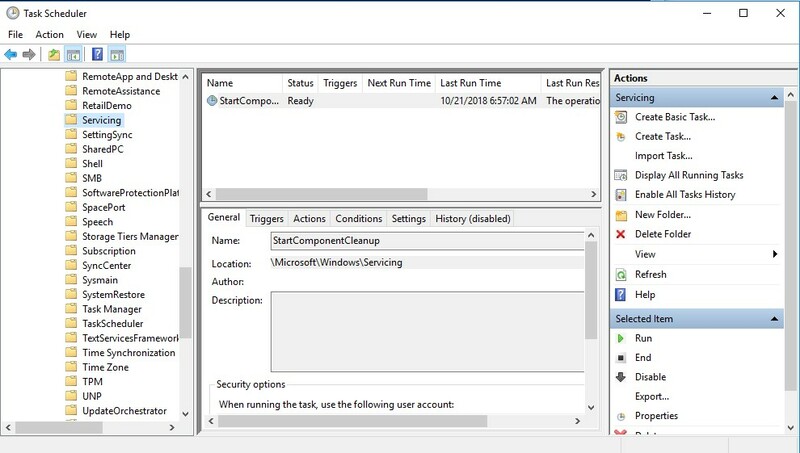 In addition, in the Windows 10 task scheduler there is a special automatic maintenance task that performs the same operation as DISM with the StartComponentCleanup option. This task removes all outdated updates older than 30 days. This task, named StartComponentCleanup, is located in the \Microsoft\Windows\Servicing section. In the article “Safe Clean Up of the WinSxS Folder in Windows Server 2012” we looked at the new option Features on Demand, that allows to remove binary files of the unused roles files from the WinSxS folder. To remove the unused roles from the disk, there is a special PowerShell cmdlet – Uninstall-WindowsFeature. The thing is that there is no Uninstall-WindowsFeature cmdlet in Windows 10 and 8.1. 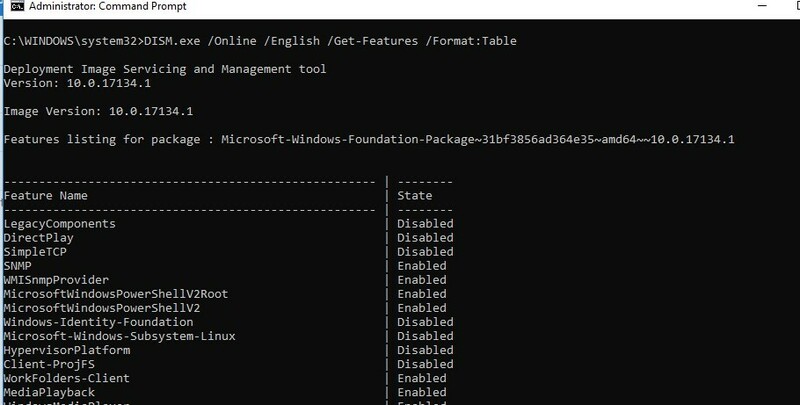 You can implement Features on Demand technology only using DISM or DISM PowerShell cmdlet. Moreover, it’s important to know that DISM command doesn’t analyze package dependencies comparing to Uninstall-WindowsFeature cmdlet. So, after removing a Windows package using DISM only the component specified in the command will be removed and all dependent packages will remain in the system. 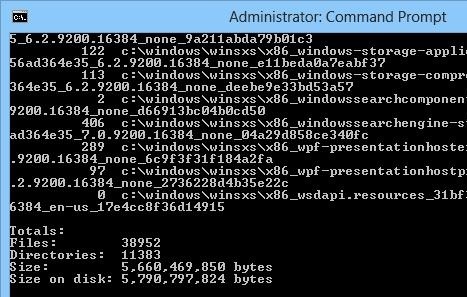 This is the reason why DISM shouldn’t be used to remove role files from the disk in Windows Server 2012/R2, since there is a more convenient and functional way to do it. If you display the list of all functions available in Windows, you will see that the component status has changed to Disabled with Payload Removed. Thus, Windows allows to significantly reduce the size of the WinSxS folder by removing the unused components from the disk. The only thing is that this cleanup method suits only for the advanced users, who are familiar with the Windows 10 components and their purpose. Another way to reduce the size of the WinSxS directory in Windows 10/8.1 is to compress the directory contents on the level of the NTFS file system. Note. 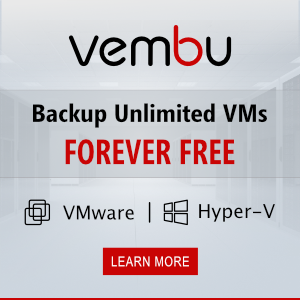 As in case of any nonstandard intervention into the system configuration, you are strongly recommended to perform a full system backup. As you can see, in our example the size of the WinSxS folder after the compression has reduced from 5.8GB to 4GB (about a third). Not bad, especially for a small-sized SSD-drive, the place on which is quite expensive. This script can be used regularly during system operation, because after new updates or applications have been installed, new uncompressed files will appear in the WinSxS folder. What may affect the NTFS compression of the WinSxS directory? Windows works with compressed files in the transparent mode. However, it can take some extra time to compress/decompress it, which means that the component or update installation processes can become somewhat slow. However, on modern CPU, the file compression / decompression is performed almost instantly, so the user may not even notice a real performance reduction. Moreover, if your HDD is slow, and the processor is fast enough, with compression you can even notice an increase in the speed of working with the disk! We should note that when the whole contents of the WinSxS folder is compressed, a number of files in some other system directories will also turn to be compressed due to the hard links. Note. You can find in the web another script that allows to reduce the size of the WinSxS folder — WinSxSLite (by Christian Bering Boegh). According to the developer, this script searches the latest library files on the disk, makes links to them from all previous versions and deletes old versions. We don’t recommend our readers to use WinSxSLite, because in spite of the idea being good, the result of running the script is unpredictable and though the WinSxS folder is reduced, some Windows functionality becomes unavailable. Successfully Processed 20618 files; Failed to process 1 file. In fact it failed to process 24000 files because it aborted due to the Access Denied failure. I tried to re-run the instruction and edited that line so it could pass that phase and it only processed 4 files more and failed again. Are you able to hint how to proceed from now? Check current permission on file x86_microsoft.vc80.crt_1fc8b3b9a1e18e3b_8.0.50727.42_none_db5f52fb98cb24ad.cat. Try take ownership of file and grant your account full rights to it. Next repeat step 8 again. It also failed on me with the restoring ‘TrustedInstaller’ part, saying access denied. I presume this is because the first steps gave my user Ownership, but, we didnt add my user as a user to the actual permissions. So, when you try to change back to TrustedInstaller, your user doesnt have the access to do that. Atleast that is how I see it. It gives my user ‘Rob’ fullcontrol first, then changes to TrustedInstaller, and then finally removes my user permission for ‘Rob’. Replace ‘Rob’ with whatever your username is. It seems that even though you can take ownership and then do things, you dont have permission to change ownership back, unless you give your user ‘Full control’ permissions. winSXSfolder shows decrease size on disk, but when I check the drive full size it actually increased. Extremely good looking guide. Most be one and only on web to go through this deep analyze of how to go further in data usage. Honestly, since Microsoft is being a brick while operating systems with full support should take less than 500MB in size while online and then consider what people actually wants to use in os the whole idea of increasing size to raise hardware market supported by all new hardware manufacturers is good for marketing, but there should be some system ripped to WinPE level where only thing that should take space is few KB driver base for all devices, but since now days a simply 500KB audio driver can turn to 250MB totally idiotic bloatware it’s hilarious really. Sadly this is possible at linux side, but Microsoft sure is enjoying the install size being around 20-30GB in full with only barebone components in the machines. Does this work with windows server 2008 sp2? KB2852386 is for Server 2008 R2. Is not applicable to Server 2008 SP2. For Server 2008 SP2, use Compcln.exe. You might want to update and mention that current versions of Windows 10 automatically clean up the WinSXS folder – and note which things you mention are not a part of the automatic cleanup. This might help users, so they aren’t taking time to repeat steps that Windows 10 is now doing for them. It might also help with confusion when the size doesn’t change, and to know when they can still rollback items. Do you talk about a task named StartComponentCleanup (located in the task scheduler section \Microsoft\Windows\Servicing)? This task deletes replacement packages files older than 30 days. When you issue `compact /s:”%WINDIR%\WinSxS” /c /a /i` instead of `compact /s:”%WINDIR%\WinSxS” /c /a /i *`, the WinSxS directory *itself* will be marked as “compressed”, too. 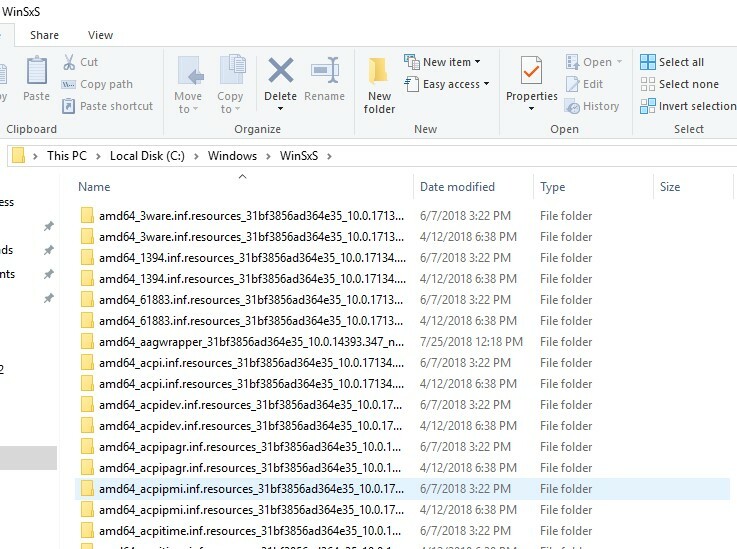 This means any newly created subfolders and files will be compressed right from the start and it’s no longer necessary to run this script periodically.